And what do you plan on doing while they are in class, Sir? The correct answer was a wry, “I wish I knew. Is there anything I can do in Howell?” End of questioning. Enjoy your stay. 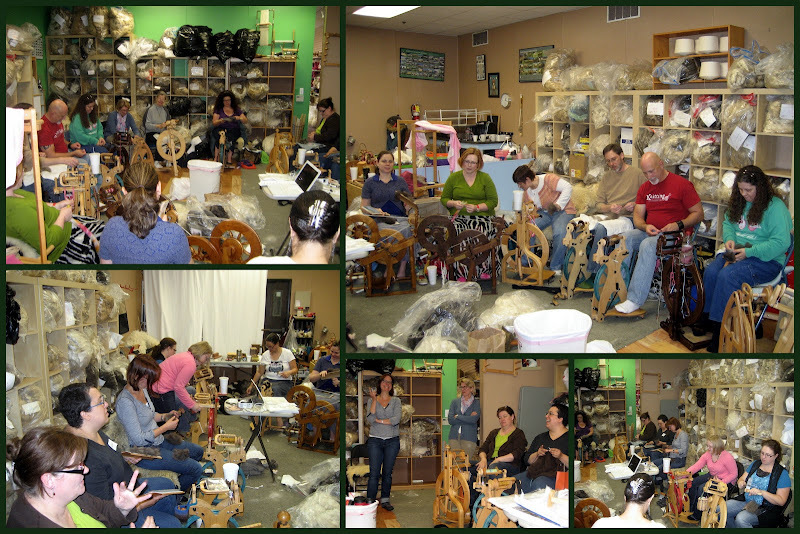 Our classes were held at The Spinning Loft with superb materials, and were taught by Deb Robson. Saturday was a focus on “3 Ls”: Leicester Longwool, Border Leicester & Blue Faced Leicester. The 3 are now more than tongue-twisters to me. Deb’s presentation on their histories & distinguishing features went deeper than data from The Fleece & Fiber Sourcebook. Yes, I took notes but really what I took away was Deb’s essential passion for her work. She fielded every question, helped anyone in difficulty, and spun happily on her Trindle. My classmates were just as engaged. How many of us introduced ourselves by saying we were signing up for the classes no matter the topic – a Spinning Loft/ Deb Robson collaboration? Yes! It was an awesome group of spinners. I especially enjoyed dinner with Sasha, thecraftyrabbit and Karen, CallMeK2 on Saturday night. My butternut Martha was very pleased to meet her twin – Beth’s walnut Martha. Any giggles in class on Sunday were entirely Beth’s fault. The 3 Cs portion moved us from the UK to Australia & New Zealand: Coopworth, Corriedale & Cormo. The fine Coopworth we worked with was downright soft. My hands-down favourite was a 3L wool, the ‘strong’ example of Border Leicester. The smart money was on me loving Cormo but there you have it. Three walls of fleece as your classroom, and you would leave with some too. This is CVM that Beth suggested for my, “crimpy for a sweater project for Lara” bill. It’s beautiful, 2 pounds full. Her classes embodied that philosophy, and I know I cannot be the only one uplifted by the experience of her teaching. Three weeks out, I am still moved and empowered in my own work. N really deserves thanks for making the road trip possible. He knows why. Thanks, Love. To answer the border agent’s question – he read on his Kindle much of the time. Categories: Fiber Preparation, Spinning, What I'm up to | Tags: Materials, Spinning, Watson Martha spinning wheel | Permalink. It was! A real highlight for the fall! The wonderful people in that room are why I love teaching. Thank you for being there, and for letting me know that “it worked.” I always go out with an idea and the hope that I can pull it (or something like it) off! Thanks, too, to N. for being the quiet one in the back corner, a welcome presence. It definitely worked wonders, Deb. Thank you for taking such a thoughtful approach, and for your amazing generosity with your knowledge. I will pass along your good thoughts to N. He was overheard explaining the weekend to his Mom with incredible acuity, and certain respect!